"Technology, Teaching, and Public School Advocate"
"Thoughts on Education, Literature, Politics, and Philosophy of Education." Not that many even I feel I have to explain myself. Why the change? I lost my religion, or stated differently: I have increasingly began to feel as if "Technology" already has enough advocates and needs more critics. 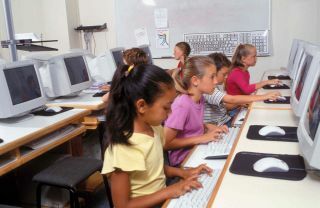 While I am sure no one really pays attention to such things, I have increasingly felt that the "Ed Tech" evangelists have become less critical of technology, and in some ways have come to believe that it alone offers the "salvation of education" and our students. I myself could so be judged from my various blather on this blog as one of the "technology-faithful." Yet, time, experience, and thought has cost me my own uncritical faith in the power of the PC (or the Mac) to lead to educational paradise. Neil Postman, that powerful critic of technology himself, perhaps had in mind the malady that inflicts the current "Ed Tech" world and education when described something called "Technopoly." He stated that "technopoly is a state of mind," and that it consists in the "deification of technology, finds its satisfactions in technology, and takes it orders from technology." It also causes the "development of a new social order," leads to the "rapid dissolution of much associated with traditional beliefs," and sees technical progress as our "supreme achievement" as well as the means by which all our problems will be solved. To me, it would seem that Postman was actually describing the basic tenants of the current "Ed Tech" religion that in some appellations appears to be a "fundamentalist religion." Don't get me wrong, I still embrace my iPhone and PC, for they allow me to do things that make life richer, easier, and efficient. I am no Luddite. But I have become a heretic of sorts when it comes to all this uncritical promotion of everything tech in education. The tenants of "ED Tech" fundamentalism should be questioned, and every time some educator, keynote speaker, tech salesman begins to sell their wares or promote their ideas, it is time lay aside our personal enthusiasm, or friendships, and our techno-enthusiasm and ask the heretical questions of whether what is said is really truth of dogma. I no longer adhere to the doctrine that "deifies" technology as the answer to all our educational problems. I also no longer think that "disruption" and "innovation" with technology is always a good thing. Are we really trying to improve our students' education or are we simply trying to promote technology for its own sake. Perhaps we are also only using technology to promote ourselves instead of what is truly beneficial for our students. Do we really think more and better technology is going to finally educate all our students? Dropping the "Technology advocate" part of my byline was important to me. Technology needs no advocate but our students do. There's enough commercial and tech industry salespersons and techno-fundamentalists out there advocating for the technology. What is sorely needed are us techno-heretics, who have a sober view of technology, and who are willing to question the tenants of Ed Tech fundamentalism. Technology can either be tools that we use to enhance our lives and the education of our students, or they can become that which directs our lives. I choose the former. Postman, N. (1993). Technopoly: The surrender of culture to technology. Vintage: New York, NY.